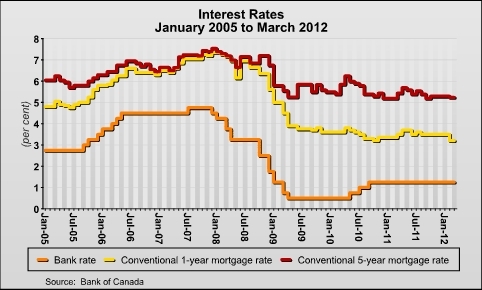 The Bank of Canada kept its trend-setting Bank Rate at 1.25 per cent on March 8th, 2012. This marks the 12th consecutive policy meeting in which borrowing costs have been left unchanged. The Bank said that the heightened uncertainty around the global economic outlook had decreased in the weeks since the Bank released its January Monetary Policy Report (MPR). That said, the global economy is still expected to grow at a pace below its long-term average owing to deleveraging in advanced economies. The Bank noted that U.S. growth was proceeding at a modest pace amid recent signs of life in the labour market, and that while Chain’s economy was slowing, its rate of growth is still high; however, commodity prices are currently higher than anticipated. Specifically, the price of oil has been pushed higher by recent geo-political concerns. The Bank warned that if sustained, higher oil prices could ultimately dampen the aforementioned improvement in global economic momentum. Focusing in on the Canadian economy, the Bank said that the outlook for the Canadian economy had improved, though only marginally, from the January MPR. The Bank expects Canadian household spending to remain high as households add to their debt burden. This was characterized as the biggest domestic risk to the outlook. Net exports have seen some improvement from increased U.S. demand, although they are still being held in check by the persistent strength of the Canadian dollar. The Bank said that inflation had been higher than previously expected owing to reduced slack in the economy and higher oil prices. That said, inflation is still expected to moderate in the second quarter of the year before returning to its two per cent target for the remainder of the forecast horizon. “Financial markets still expect interest rates to be hold until well into next year, and today’s announcement confirms the Bank is perfectly happy to sit on the sidelines, and is no closer to raising rates now than it was in January,” said CREA Chief Economist Gregory Klump. As of March 8th, 2012, the advertised five-year lending rate stood at 5.24 per cent. This is down 0.05 percentage points from 5.29 per cent on January 17th, when the Bank made its last policy interest rate announcement. The Bank will make its next scheduled rate announcement on April 17th, 2012.